BPI’s mobile banking facility called BPI Express Mobile, allows BPI account holders to enjoy the convenience of doing wide range of bank transactions such as balance inquiry, fund transfers, bills payment, Smart prepaid airtime reloading and Smart Money reloading through their mobile phones. This service has been made available to Smart subscribers since September 2009. The BPI Express Mobile comes in two variants. The SMS-based and Internet-based. The SMS-based BPI Express Mobile works with just a Smart SIM menu and the text messaging facility of Smart, even without connecting to the internet. The second variant, Internet-based BPI Express Mobile, can do the same transactions as SMS-based and more except Smart Money related transactions. To learn more about Internet-based BPI Express Mobile, click here. 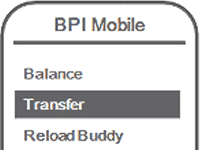 Here’s how to setup and use SMS-based BPI Express Mobile on your Smart cellphone. Text ENROLL <Account Number> <Joint Account Indicator> and send to 3274. BPI will send a confirmation message. Choose Mobile Banking in SMART Menu. Choose Activate. If you already have an active bank, proceed to step 4. Now, you are ready to use BPI Express Mobile! Account Key is composed of 2-letter Account Type and last 4 digits of your account number. Account Type; SA = Savings Account, CA = Checking Account. (e.g. SA1234). Balance Inquiry is also available in your Smart Menu. Enter amount to be transferred. Use either # or * if decimal point is not available. BPI to Smart Money Transfer. Transaction fee is Php 15 to be deducted from your BPI account. If you want to transfer Php 8,000 to your Smart Money, you will be charged Php 8,015 from your BPI account. Smart Money to BPI Transfer. I tried it, it’s not working. I called Smart and they told me this is not possible. I’ll just write this down in case they implement this in the future. Choose My Buddies (see Personalized Lists C6 to add Buddies) or Others. Bills Payment. Requires BPI-Smart Biller Codes. Personalize Lists (for My Buddies and My Bills). Choose My Buddies to add Buddies or choose My Bills to add billing accounts. Only Smart Money Biller Codes can be saved in “My Bills” list. For other transactions, visit BPI Express Mobile for Smart. Folks, puwede kaya i-link/enroll yung deposit account ng BPI Easy Saver? Kailangan niyo mag send tru text: SENDMPIN to 3274. Guys, if ‘di kayo nakareceive ng MPIN, tawagan nyo lang yong BPI. Hindi rin ako naka receive ng MPIN after a week pero nung tumawag ako, naka-receive na ako ng MPIN. Ed p.Wala pa rin yung mpin, 6 days ago na ng mag enroll ako.why? same here…. 🙁 called bpi and smart. still no answer. sabi bpi dapat 8am the next day meron na. and sa system ng bpi activated na.